At one level, the tides are simple. Water comes in and water goes out. At another level, explaining how this happens, and explaining why the tides differ in times and intensities is very complicated. One of the forces that contribute to the tides is gravity. Newton’s Laws of Gravitation say that any two bodies in proximity to each other will have an attraction for each other. The larger the bodies the larger the attraction and the closer the bodies the larger the attraction. The sun, moon, and Earth all have gravitational attration for each other. As these solar bodies pull on the Earth, the oceans are moved within their basins. Even though the sun is much larger than the moon, the moons influence on the tides is greater because it is so much closer. Centrifugal forces produced by the revolutions of the earth and moon (and earth and sun) around their common center-of-gravity also have a significant role to play in the movement of the tides. Watching this Tidal Animation may help you understand this better. Spring tides occur when the moon and sun are pulling together. This happens during new moons and full moons. Spring tides have the highest high tides and the lowest low tides during any given tidal cycle. Neap tides occur when the the moon and the sun pulling at right angles to each other. This happens during a ¼ and ¾ moon. These tides are more moderate. Examine the graph below. This is a tide table. It shows the high and low tides over the course of a month. Can you tell which days show neap tides and which day’s show spring tides? Since the moon follows an elliptical path rather than a true circle, the distance between the earth and moon will vary throughout the month by about 31,000 miles. The moon’s tide-producing force acting on the earth’s waters will change in inverse proportion to the third power of the distance between the earth and moon, in accordance with the previously mentioned variation of Newton’s Law of Gravitation. Once each month, when the moon is closest to the earth, the tide-generating forces will be higher than usual, thus producing above average ranges in the tides. Approximately two weeks later, when the moon is farthest from the earth, the lunar tide-raising force will be smaller, and the tidal ranges will be less than average. Similarly, in the earth-sun system, when the earth is closest to the sun, about January 2 of each year, the tidal ranges will be enhanced, and when the earth is farthest from the sun, around July 2, the tidal ranges will be reduced. Different areas around the world experience different types of tides. Some places have two high and two low tides a day, these are known as semi-diurnal tides. Some places have one high and one low tide a day these places are called diurnal tides. Some places that has two tides a day but of uneven size is known as a mixed tidal area. To live and thrive in the intertidal requires adaptability and a unique tool kit of responses to changing conditions. Click to watch and animation of tide coming in. Intertidal organisms tend to group themselves by zones based on certain physical limitations (abiotic factors that affect their ability to thrive). A single intertidal area can be divided into several zones where environmental conditions differ. The splash zone: organisms in this zone are adapted for long periods of exposure to air and the possibility of desiccation. 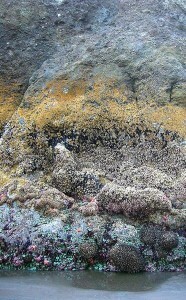 The upper-intertidal zone: organisms here are exposed to desiccation as well as the force of breaking waves. The mid-intertidal zone: in this zone, periods of exposure to air and the threat of desiccation are reduced, but living in prime real estate has its price as competition for space and pressure from predators becomes increasingly important. The lower intertidal zone: this area is not subject to severe wave or tidal forces except for minus tides, therefore more delicate sessile species and motile species not adapted for high energy live here. What is a spring tide? What conditions (of the Earth, moon, and sun) cause a spring tide? What is a neap tide? What conditions (of the Earth, moon, and sun) cause them? You and a friend decided that you want to plan a clam digging trip in Tutka Bay (a half-hour boat ride from Homer, Ak) next May. What is the best day and time to go? (Hint: clamming is best done on the lowest minus tides.) Justify your answer. Explain the difference between diurnal, semi-diurnal, and mixed tides. What “type of tides” does Anchorage have? -Diurnal, Semi-diurnal, or mixed tides? How do the extreme high tides of Cook Inlet complement the treatment process at Anchorage’s main waste water treatment facility? Cook Inlet and especially Turnagain Arm, have some of the highest tidal fluctuations on Earth. Turnagain Arm frequently experiences, bore tides. What are they, and where could you see one, and what would have been the best days to do that this fall? Why do tides follow a 24 hour and 50 minute cycle instead of the expected 24 hour cycle? King tides are a colloquial term used to describe, extremely high tides. Why are king tides becoming more common, and how are cities like Miami dealing with them? Describe what the conditions are like in each of the inter-tidal zones listed below, then go to Arkive.org – intertidal species and give two types of organisms that might be found in each of the different tidal zones along the Pacific Coast of North America. You may also use tidalzone.org.